Here at Fort Collins Foreign Car Service, we provide auto repair in Fort Collins. Nowadays, cars are much more than a luxury; they are a necessity for all kinds of things, including getting to work, feeding the family, and meeting friends. Because they are so important and integrated into our daily lives, we tend to take them for granted. But a lot goes into the cars that we drive. For your entertainment, here are some fun car facts and statistics that you may not have known. Cars have been around for almost 150 years. In that time, a lot of changes have been made. Here are some interesting car statistics. Right at this very moment, there are over one billion cars currently in use around the world. That is a lot of fast moving metal! Every single day around the world, about 165,000 different cars are manufactured. What are we doing with the old ones? Have you ever wondered just how many different parts a car is made up out of? A lot, it turns out, as the average car has about 30,000 different parts. Rolls Royce is known for quality manufacturing. Maybe that is why it is not so surprising that out of every car that the company has ever sold, 75 percent of them are still able to run on the road today. We all hate traffic, but do you know how long the average American will spend sitting in it? The answer is about 38 hours a year that an American driver will sit waiting in traffic. It is safer to drive than it has ever been before. But that doesn’t mean that accidents don’t still happen. Currently, the odds of dying from a car accident are about one in 5,000. The highest mileage a vehicle has ever made it to is 2,850,000, or 4,586,630 kilometers. The average American vehicle will spend 95 percent of its lifetime parked. According to some studies, 40 percent of all drivers involved in a car crash never put their foot down on the brakes. For cars made to day, on average up to 80 percent of their parts are recyclable. By the year 1900, 40 percent of American cars were still powered by steam. At this time, 38 percent were powered by electricity, and 22 percent were powered by gasoline. About 33 percent of the world drives on the left side of the road rather than the right. In the city of Los Angeles, as much as 14 percent of all land use comes from parking spaces. According to one 2009 study, Hummer drivers receive about five times as many tickets as the average American driver. A lot goes into making a car. Check out some of these fun car facts that you may not have known. We all have experienced the joy of a “new car smell”. But did you know that that smell is due to the composition of many different compounds, about 50 of the volatile organically? If you could drive to the moon like you do on the road, it would take you about six full months to get there at an average speed of 60 miles per hour. In Brazil, 92 percent of all new cars that are sold use ethanol instead of gasoline as a fuel. Ethanol is made from sugarcane, and is much more environmentally friendly to burn than gasoline. The corporate world can get confusing, especially when one company ends up buying up others within its industry. One such case in the auto industry is Volkswagen, which also owns Bugatti, Bentley, Lamborghini, Audi, Porsche, and Ducati. Somebody had to be the first to be in a car accident. As far as recorded history is concerned, that honor goes to a driver in Ohio in 1891. Back when it was first introduced, the car radio caused real controversy. Bans were proposed for the devices on the grounds that they distracted drivers and caused more accidents. In Russia, driving around with a car that is considered too dirty is actually a criminal offense. For Americans younger than the age of 35, car wrecks are the number one cause of death. In the country of Turkmenistan, citizen drivers are entitled to up to 120 liters, or 31 gallons, of free gas every month. In Los Angeles, there are actually more cars than there are people. The person who invented the cruise control feature in your car was legally blind. While not the fastest car in the world, the Bugatti Veyron Super Sport is the fastest street legal car in the world. It can reach speeds of 267 miles per hour. Henry Ford, of famous Ford Model T fame, once created a car out of soybeans. The modern three point seat belt, which currently saves a life every six minutes, was created by Swedish company Volvo. They left their patent open to the public so that other car manufacturers could use it for free, all in the interest of public safety. In 2012, Nevada was the first state to start issuing licenses for self driving cars. 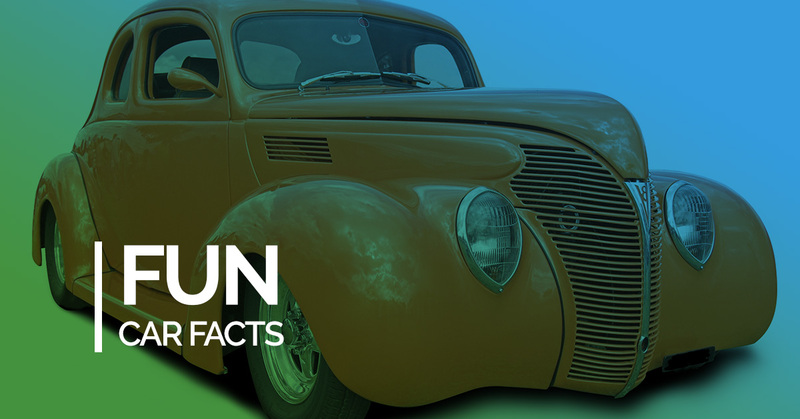 We hope you enjoyed these fun car facts. If you are looking for an auto repair mechanic in Fort Collins, then Fort Collins Foreign Car service is the place to go! Feel free to drop by our shop and see some of our work for yourself. For more information, please do not hesitate to give us a call today. One of our friendly and knowledgeable representatives will be happy to answers any questions that you may have.